Christmas time is always so hectic for our family because it is the busiest time of year for the business. With holiday shows and so many extra packages to ship, I have very little time left to decorate the tree and shop for gifts. Christmas cards have gone by the wayside the last few years. Since we had Fiona, I haven't had a chance to send out Birth Announcements (so sad, it's true what they say about second children, I also haven't written a word in her baby book). I am determined to do cards this Christmas! 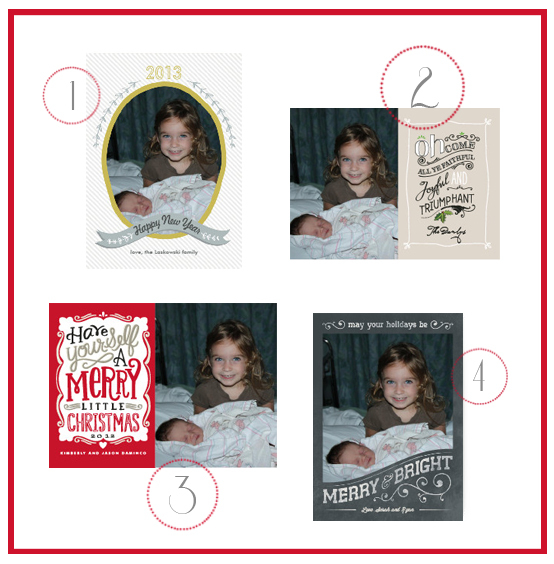 I recently discovered Minted and they have an excellent selection of holiday cards by indie designers. They have tons with a vintage feel and they are printed on really high quality paper. My favorite part is you can upload your own photo and browse all the cards with your photo inserted. These are my top four choices, now I just need to narrow it down. They are all beautiful, but number 4 is my favorite!